cask Mild in the brewery's tasting cellar. Ranking very near the top of my “beer nirvana” list is the sublime joy of a fresh, well maintained, real ale in a personable English pub. This article is an overview of my recent Manchester and Sheffield travel notes that outlines the real ale breweries and pubs visited and a few of the remarkable beers tasted. I flew across "the pond" to Manchester in July of 2006 with my friend Thel Melton for a short, three-day cask ale excursion. Manchester and the surrounding areas are known in beer circles as top destinations for pubcrawling and cask ale imbibing. Manchester is a thriving city that is experiencing huge growth in its economy and landscape in recent years. The beer and brewery landscape of the city has changed as well – some classic pubs have closed and more modern ones have opened. 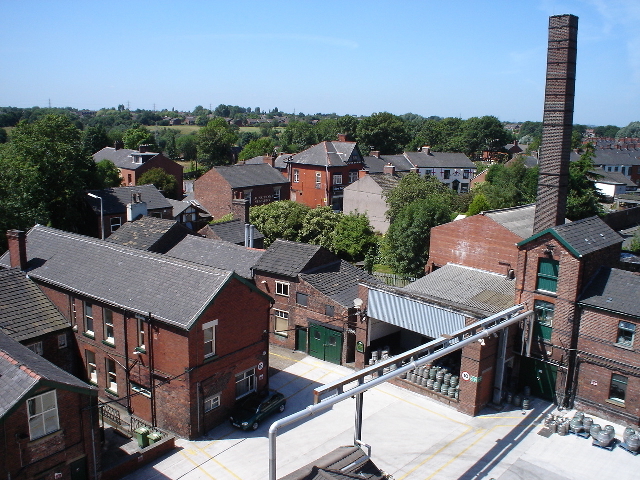 The closing of the iconic Boddingtons Brewery at Strangeways in 2004 by brewing giant InBev was a depressing blow for the brewery’s many employees and Manchester ale lovers. Cask-conditioned Boddingtons is now brewed at the Hydes Brewery on the other side of the city, and canned Boddingtons is produced at a variety of other facilities owned by InBev. Be sure to buy a day pass for unlimited train rides in Manchester – this is an easy and economical way to get around town. Our first stop in Manchester was the historic Greengate Brewery – manufacturers of J.W. Lees beers. The brewery is a short walk from the Mills Hill station in the Oldham neighborhood and produces an admirable range of beers that include a mild, bitter and an exceptional strong ale called Moonraker (7.5% abv). Giles Dennis (J.W. Lees’ head brewer for 25 years) showed us around the lovely facility that got its brewing start back in 1828. The brewery was reconstructed in 1876, and the architecture from that period is still immensely apparent today. J.W. Lees has seen its ups and downs over the years, but there has always been a member of the family to step in and keep the business on the right track. In the states, look for the company’s exquisite 11.5% abv Harvest specialty ales that are aged in various distilled spirit casks. After our morning brewery visit, it was time to head back to central Manchester to start my city pub crawl (see the pub picks at the end of this article). Be warned that many of the pubs in England do not go to the trouble of stocking real ale. 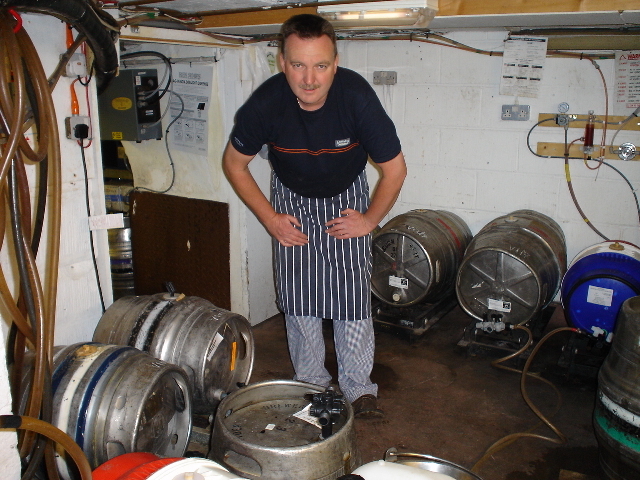 The cask-conditioning process is time consuming and takes training, dedication and talent to perform properly. Often you will pop into an attractive old pub only to see standard kegged beers and lagers. Be sure to get a copy of The Good Beer Guide that is published each year by a grass roots association of beer advocates called the Campaign for Real Ale (CAMRA). This essential guidebook lists only pubs that serve well-cared-for real ales, and useful information such as addresses, train stops, opening hours and typical beer selections for each pub are included. I needed coffee and a full English breakfast the next morning to make it out of bed and onto a train for a day trip to the former steel production town of Sheffield. Retail outlets, office buildings and condos have now replaced steel factories in Sheffield, but this friendly and attractive town still holds many destinations of interest to lovers of real ale. The Kelham Island microbrewery is situated in Sheffield right behind Fat Cat pub on Alma Street, and owner/brewer Dave Wickett is also a partner in the new Thornbridge Country House Brewery located just outside Sheffield in the scenic countryside of Derbyshire. Simon Webster works in marketing for the brewery and drove us from Sheffield out to Thornbridge for a quick look around. 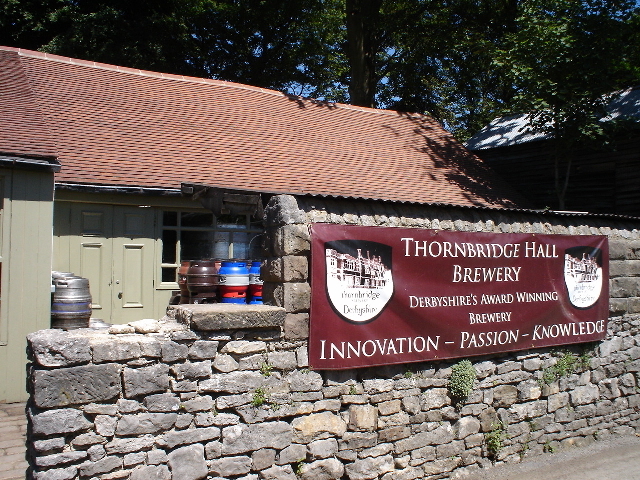 Thornbridge’s compact brewhouse is located in an old stonemason’s shop nestled on the grounds of a stately mansion called Thornbridge Hall. The home and grounds surrounding the brewery are absolutely gorgeous, and the ales produced by Stephano Cossi (Thornbridge's head brewer) are all outstanding. The award-winning brewery produces an excellent range of beers that include Lord Marples bitter (very drinkable with a subtle malt and hop richness), Blackthorn golden ale (a refreshing ale for summer imbibing), Brock stout (medium/full bodied and very roasty), and the warming and potent St. Petersburg Russian imperial stout. Thornbridge’s hoppy Jaipur India pale ale was honored with a silver medal in the Strong Bitters category at the 2006 Great British Beer Festival in London. A great Derbyshire pub in which to enjoy the Thornbridge beers is The Monsal Hotel's Stable Bar (near the Peak District National Park) that boasts eight excellent, rotating cask ales. The Thornbridge beers are just one more reason to plan a walking tour and pubcrawl in this aesthetically pleasing area of Derbyshire. Our Sheffield pub crawl later that afternoon was conducted mostly by city tram and included attractive, cozy pubs (see pub list) offering some of the best cask ales from local micros that I have ever sampled. One of the hazards of English pub crawling is that many independent pubs stop serving food around 6 p.m. or so – I often get so caught up in beer sampling that I end up having nuts and crisps (potato chips) for dinner. There is a big national pub chain called Wetherspoons that is known for converting old buildings into large, attractive pubs that serve 2-3 good cask ales and hearty pub meals late into the evening. Wetherspoons has saved me from starvation on many an evening. The Cask and Cutler Pub in Sheffield should not be missed. My favorite pub experience the next day back in Manchester involved taking the train out a few stops to Stalybridge. 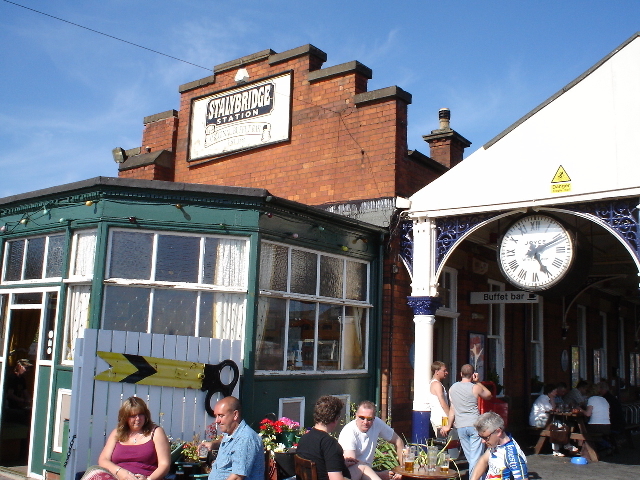 As you step off the train you will see the famous Stalybridge Station Buffet Bar on the platform. Real ale lovers from all over the region flock to this pub that offers Victorian charm and four rooms that are filled with pub and train memorabilia. Sylvia Wood is the long time cellarmistress who takes great pride in assuring that her ten cask-conditioned ales are the best available and always kept in peak condition. The wholesome food goes extremely well with the beer. The following day on the plane back to Atlanta I reminisced about how much I enjoyed the pubs and their real ales. The flavors of the beers and the character of the pubs seem to combine for warm, rich, rewarding experiences for me. But for a time in the 70’s through the 90’s it appeared that real ale and real pubs were an endangered species. Younger drinkers became infatuated with bland lagers and looked upon classic, three-dimensional ales like milds as “an old man’s drink.” It was not pretty. After many years of decline, sales of real ales are now on a steady increase in the United Kingdom due mostly to the efforts of CAMRA. English beer drinkers (even many younger ones) are now realizing that cask ale holds a great deal of appeal in terms of history, flavor and sophistication. CAMRA organizes the annual Great British Beer Festival in London that was proud to welcome its millionth festival attendee in 2006. The organization’s membership is at a record high and its new “Wild about Mild” campaign has drawn much-deserved attention to mild ales and has been successful in a significant increase in mild production this year in the U.K. The future does look very promising for English cask ale, and I urge you to visit England soon to do your part in supporting the fine ales and pubs that are so much a part of that country’s national heritage. Bar Fringe, 8 Swan Street – A cross between a Belgian beer bar and an English pub. Cask ale and many fine Belgian bottled beers are available in the bar or the beer garden out back. Britons Protection, 50 Great Bridgewater Street – City center pub with antique tilework, a long front bar and two additional rooms in back. 4-5 nice real ales from regional breweries. Crescent, 18-21 Crescent – Independent pub with ten noteworthy cask ales. The pub is owned and operated by the friendly husband and wife team of Sal and Idy. Knott, 374 Deansgate – The interior looks more like a funky college bar than an English pub, but there are excellent real ales here along with beers from Belgium and Germany. 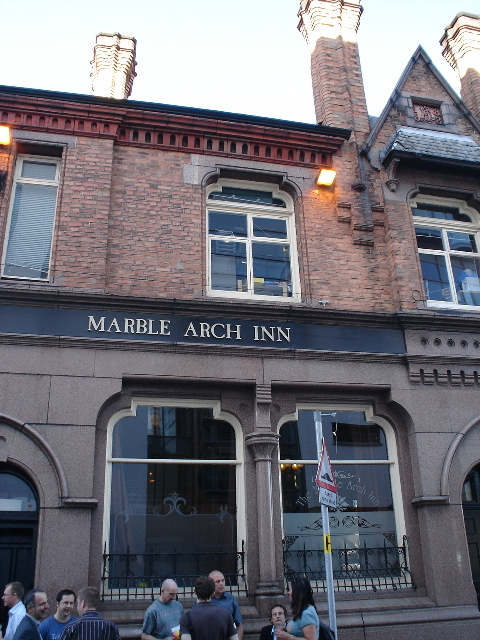 Marble Arch, 73 Rochdale Road – Wonderful brewpub producing a fine range of house real ales. The tiny brewery is in the back behind a non-smoking dining room. 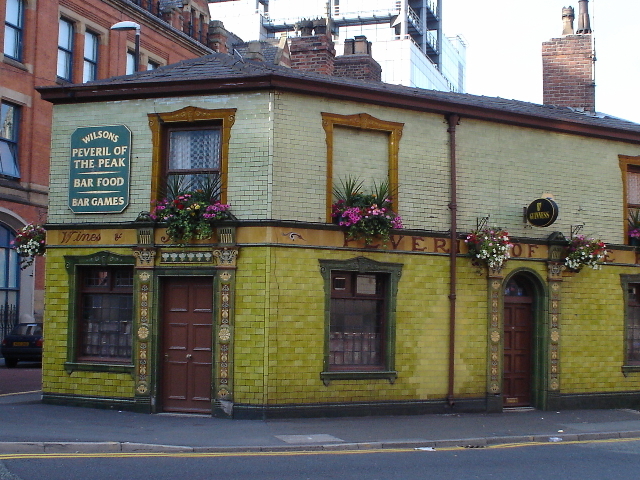 Peveril of the Peak, 127 Great Bridgewater Street – This gorgeous old masterpiece has green tiled outer walls and dates back to 1834. “The Pev” has managed to hang on despite years of development with trendy restaurants and apartments springing up all around. Rain Bar, 80 Great Bridgewater Street – Beautiful J.W. Lees pub across the street from Peveril of the Peak. Named Rain Bar because it was built on the site of an old umbrella factory. Try the J.W. Lees bitter, mild or Moonraker strong ale. 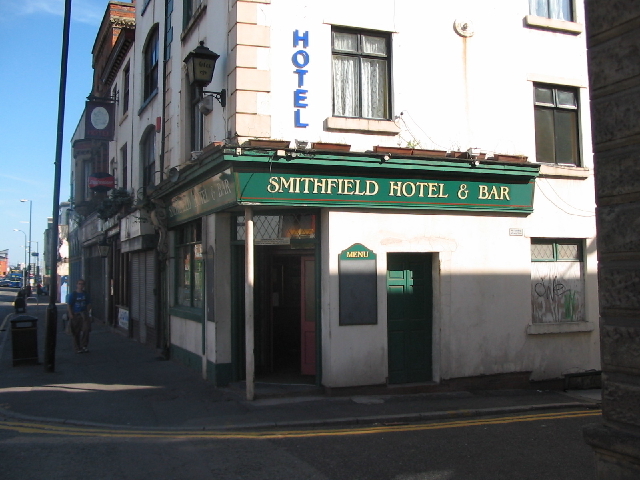 Smithfield Hotel & Bar, 37 Swan Street – Located in the lobby floor of a small B&B. 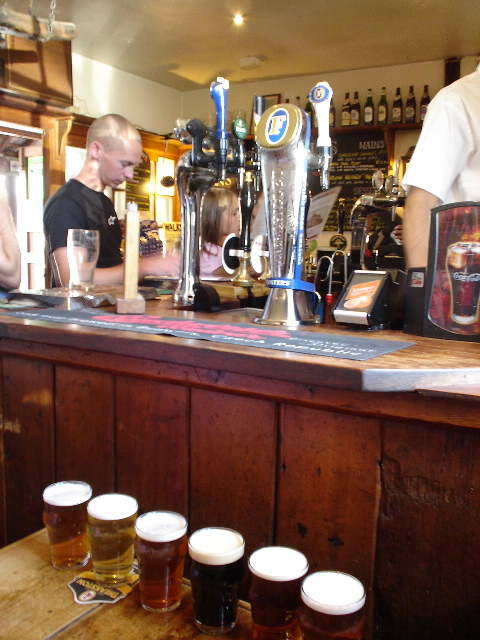 The eight real ales are hand-picked by a devoted and knowledgeable staff. 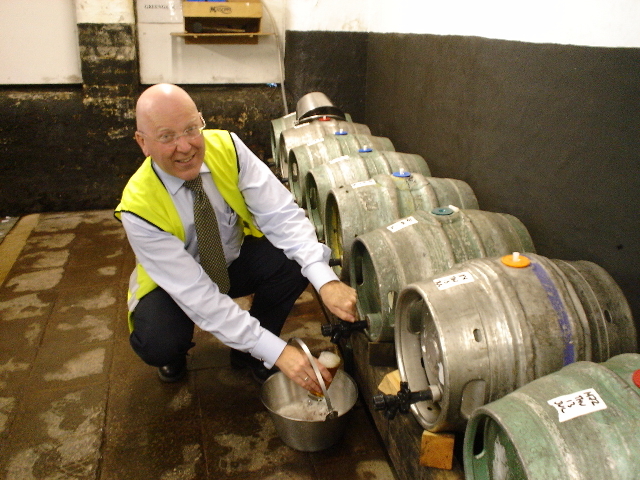 The last beer festival held in the bar and cellar offered 52 casks! Stalybridge Station Buffet Bar, Platform 1, Stalybridge Station – See description above – a must-see pub! Banker’s Draft, 1 Market Place – Wetherspoon pub in a large, two-story converted bank building. Good real ales and pub meals served all day. 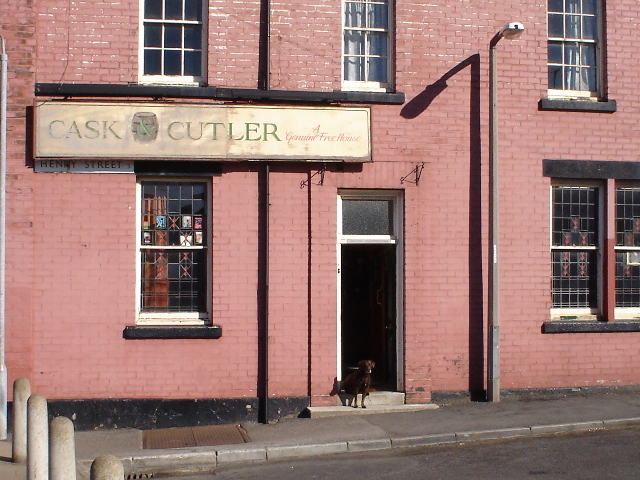 Cask & Cutler, 1 Henry Street – The highlight of any great real ale pub crawl in north Sheffield. This pub (refurbished in the 1940’s) seems to be the meeting place of every hard-core, real ale geek in the city. The nine taps offer a superb range of ales from local microbreweries. Devonshire Cat, 49 Wellington Street – Trendy, modern looking bar in the bottom corner of a large building. Some of the wide array of real ales and ciders are served by gravity tap in a glass-enclosed, temperature-controlled display room behind the bar. Fat Cat, 23 Alma Street – This delightful pub serves as the brewery tap for the Kelham Island microbrewery and offers regular and vegetarian cuisine, guest ales, and a variety of different dining rooms and an outdoor patio. Frog & Parrot, Division Street – Comfortable pub with a row of windows convenient for people watching. Six real ales. Hillsborough Hotel, 54-58 Langsett Road (a dozen or so short blocks northwest of Cask & Cutler) – A small brewhouse is located on the premises producing ales under the name Crown & Wellington. A wide range of guest beers are also offered. 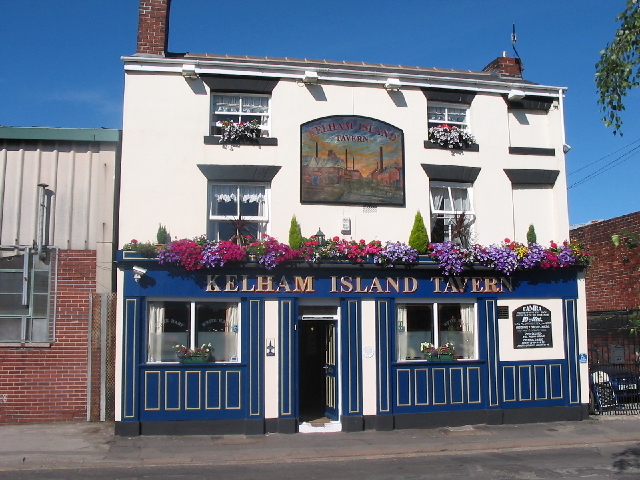 Kelham Island Tavern, 62 Russell Street – Trevor Wraith has owned this pub for almost five years and functions as cook and cellarmaster. There are eleven exceptional cask ales here with a mild and stout always on handpump. In the summer check out the beer garden that is filled with lush vegetation and flowers. This pub is not associated with the nearby Kelham Island Brewery.